I'd like to give my contribution to the effort of some users in order to solve the current situation on the English SE. I asked this same question to Waiwai933 in his "A look at question quality" as a comment.. 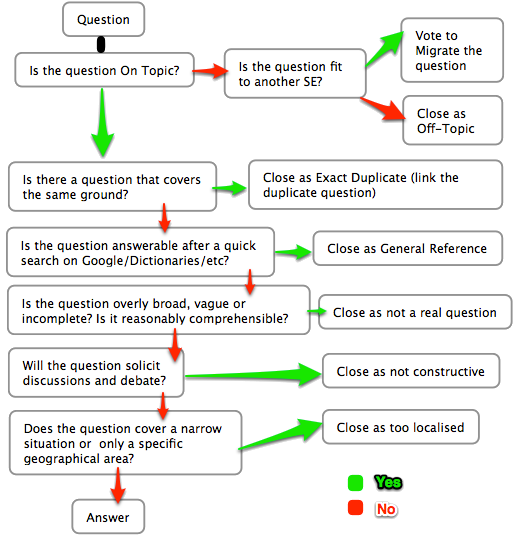 I wanted to ask the community, especially the Moderators, when opening a recent posted question, how should we proceed on closing it? First look whether it's On Topic? Or if there is a possible Duplicate? I didn't find a similar question asked on this Meta, nor after some Google search. On StackOverflow they ask something that seems similar, but it's not related. Is it easily answerable with Google or dictionaries? Is it vague or incomplete? I know the questions here are too simple, I chose the "shortest and fastest" way, even if when considering a question, we actually have some thinking first before closing it. Then, my question is: What is your opinion or, if available, is there an official way to proceed I'm not aware of? EDIT: This is what I meant. This scheme is not definite and I've done it according to the order I wrote above. It's merely a demonstration. If this matter gains importance, and I think that even if it's not the most important one it's still something we can think about, I'll re-do it according to the final opinion. Feel free to comment whether you think this is some issue we should take care of or if it's not that important. I would suggest checking for duplicates first. If a question is both off-topic and a duplicate, then the existing question needs to be closed as off-topic, and the new question needs to be marked as a duplicate. Next is topicality, because it doesn't matter how well-written the question is, nor how interesting and general, if it's off-topic for this site. After that, it's really up to personal preference; I don't really see anything about Not Constructive, Not a real question, Too localised, or General Reference to definitely prioritize one over the others. And this all really depends on the specific question: for example, if the question is so badly written that you can't make heads or tails of it, then it needs to be marked NARQ, even though it might also be a duplicate, off-topic, or general reference. I like you ordering and your wording better (I wouldn't be unhappy if they changed), but I don't think they would be top of the list for features to enhance by the SE developers. Isn't the order of these, the wording of these for the entire stackexchange software? Ask for a 'feature' change on meta.stackexchange. I check which of the closing reasons applies, following the order they are listed in the dialog box for voting to close a question; this means that I would not close as general reference a question that is duplicating another one, or that is off-topic. Isn't EL&U a special case among StackExchange sites? Don't we need special mod privileges?